There is a certain popular chip brand out there that advertises that it’s impossible to eat just one. 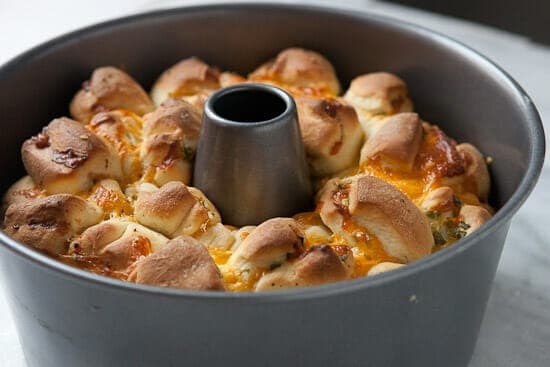 Likewise, I can guarantee that you will not be able to each just one piece of this Cheesy Savory Monkey Bread Recipe! That’s especially true if the monkey bread in question is this cheesy monkey bread laced with cheddar and scallion. 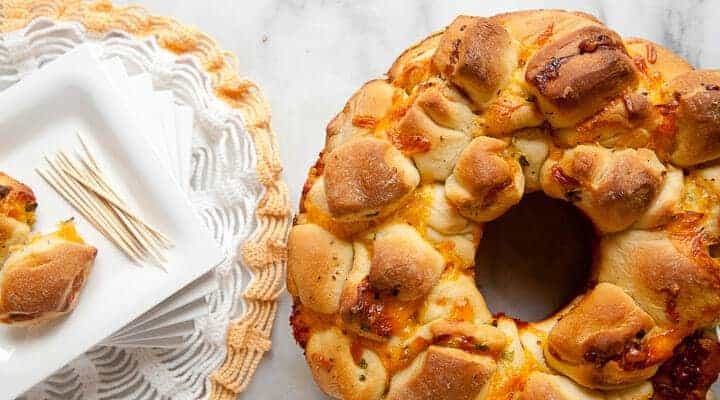 While I like a sweet monkey bread as much as the next dude, this savory version really won me over. I ate about a quarter of it by myself. It might just need the savory monkey bread recipe you need for Easter this year! This recipe was updated March 28, 2019 to add new images and update description! This savory monkey bread is my new favorite breakfast (or anytime) dish. It’s easy and fun to make and even easier to eat! 3)Turn dough onto lightly floured counter and knead briefly to form smooth, round ball. Coat large bowl with a drizzle of oil. Place dough in bowl and coat surface of dough. Cover bowl with plastic wrap and let rise until dough doubles in size, about an hour. 4) For the fillings, grate cheese. 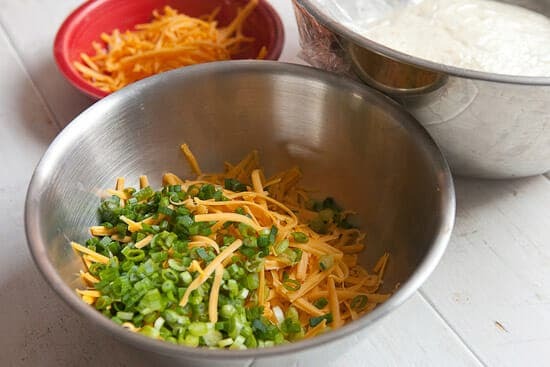 Set one cup of grated cheese aside and stir the other two cups together with diced scallions. 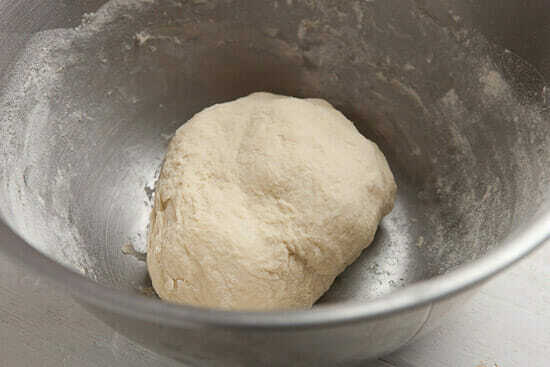 5) To finish bread, remove the dough from the bowl, and pat into a rough 10-inch square. 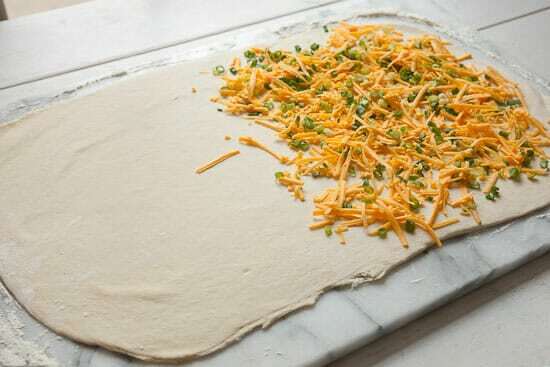 Sprinkle cheese/scallion mixture on half of the dough and fold it over. Then roll out again to a square. 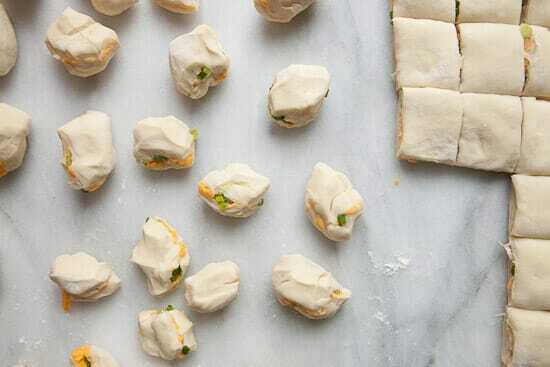 Using a bench scraper or knife, cut dough into tiny 1 inch pieces. 6) Melt butter for dipping and stir with garlic powder, paprika, and pepper. 7) Roll each piece into a rough ball and dip into the melted butter, allowing excess butter to drip back into the bowl. Then layer balls in the Bundt pan. Try to stagger the balls so they form a single thing. Occasionally sprinkle balls with just grated cheese (go light). 8) Cover the Bundt pan tightly with plastic wrap and let rise for another hour until the balls are about 2 inches from the top of the pan (at least an hour). 9) Preheat oven to 350 degrees. Unwrap the pan and bake until the top is deep brown, about 35-40 minutes. Cool in the pan for 5 minutes, then turn out onto a late and allow to cool slightly, about 10 minutes. This is a really simple dough to pull together (I mean that). While you could use a stand mixer, I made this version using only my hands. Old school style. The dough I use for this savory monkey bread is still one of the easier doughs you can make in my opinion. Basically just combine the liquids in a bowl (it’s best if they are slightly warm). 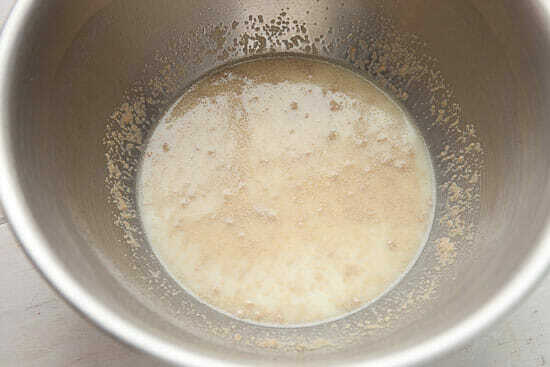 Add the sugar and then stir in the yeast and let it start to foam a bit. Once it’s foaming, add in the salt and flour. Stir this all together. 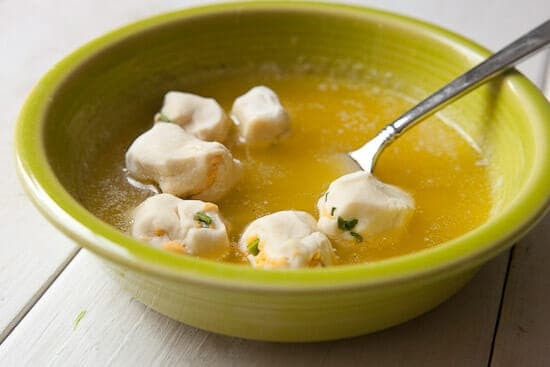 After a few minutes of stirring your dough should form a ball and then you can just lightly knead the dough in the bowl until the ball turns soft and smooth (4-5 minutes). 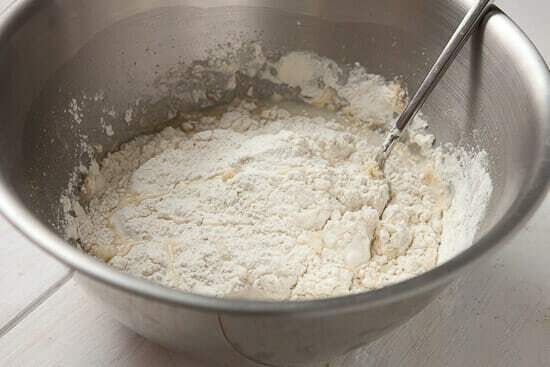 If the dough is really sticky, add more flour by the handful. Drizzle the dough with a little oil and cover it. Let it rise for 90 minutes or so until it doubles in size. It’ll rise really quickly because of the high yeast content. This cheesy monkey bread is everything I want in a savory brunch bread. Cheese and scallion. Mix most of the grated cheese with the scallion but leave some unmixed. These are the fillings you need. When your dough is puffy, roll it out on a lightly floured surface. Then sprinkle half of it with the cheese/scallion mixture. You can really pack it on there. Fold the dough over and press it down firmly. 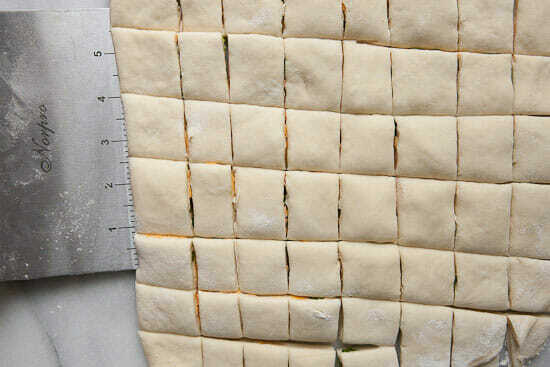 Then cut the dough into about 1 inch squares. It’s actually good if they aren’t all the same size. You should end up with 60-80 balls. Then just roll all of these into little balls. This would be a sweet helper job for any kids sitting around! Dip each ball in the butter mixture (melted butter with garlic powder, paprika, and black pepper). Stir these around a bit. Then stack these in your bundt pan! 1) Butter the pan first to make sure you can get the bread out at the end. 2) As you are layering the balls, sprinkle in some of the grated cheese that wasn’t mixed with scallion. As the bread bakes, this will glue everything together. 3) Try to make the stacking even. 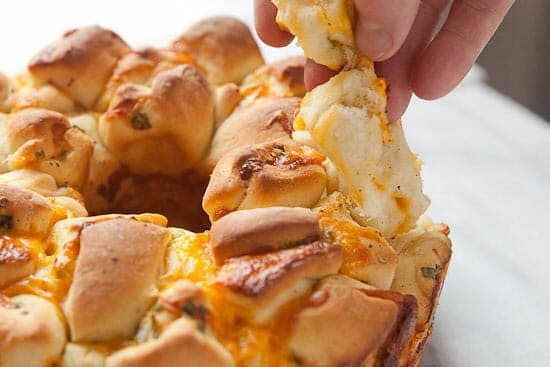 When your cheesy savory monkey bread is completely stacked, cover the bundt pan and let this rise a second time. The balls should really puff up in the pan. Let them rise for at least an hour. Then bake the whole thing at 350 degrees for about 40 minutes. Let the bread cool briefly and then run a knife around the bread so it comes out easily. I like to serve savory monkey bread with toothpicks or you can just peel off a piece. Easy to pull it off. Making a monkey bread (savory or sweet) is my new Christmas tradition. You can actually make the dough and assemble the dish the night before and refrigerate it. Then just take it out 30-45 minutes before you want to bake it and pop it in the oven! Here are a few other great Brunch Bread recipes! To answer your question. Amazing!!!! I will be making this today! I will post later with my taste test reaction. Nice Rob! Let me know how it turns out for sure. Good luck! Taste test results….Amazing!!! I did alter the recipe, replacing the scallions with crumbled cooked bacon as my kids do not like them. My kids enjoyed making this with me! I paired this with homemade tomato soup cooked in the pressure cooker which is a perfect pairing. This is a keeper. Yum, I want a big piece of this, going on the menu list! Oh, this sounds AMAZING! Can’t wait to try it! I love making bread. Wow! This looks amazing! Thanks for sharing. Ummm….wow! This looks so amazing! Pinned! This just blew my mind. Incredible. A quick question: If I prep this the night before, should I let it rise the second time after assembly prior to refrigerating it? It looks awesome, thank you! Hey Jennifer! 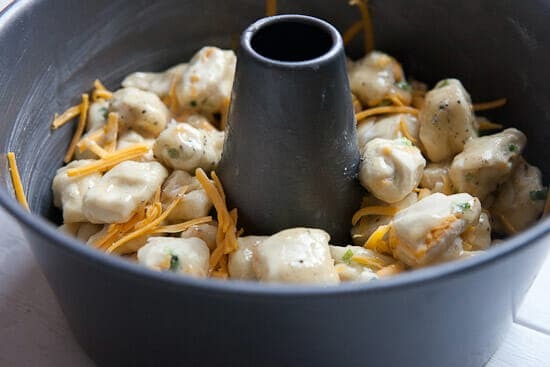 If you are actually putting the balls in the pan and letting that sit overnight you can just let it warm up a bit to room temp (maybe pull it out 30 minutes before baking). If you are just making the dough, then you’ll need to let it rise after you get it all in the pan. Hope that helps! Can I leave the dough sitting longer than 90 min? Sure Nancy! I’ve left it overnight before actually. If you are gonna leave it for many hours, stick it in the fridge which will slow down the yeast a bit. Good luck! I’ve made this twice and each time my guests are super impressed! Thank you! Way too much butter! Just made it and the butter ended up dripping in the owen making my smoke alarm going off and then dripping all over the kitchen floor (I put baking sheet under the baking pan but there was butter oozing out everywhere!) next time I will omit dipping it in butter, saving calories too. and using olive oil instead of butter for the dunkin’. Also will try it with sprouted flour. Thank you for sharing! Awesome. Hope it works for ya! What would be a good dip to add with this? Hey Maddy! I don’t think it needs one honestly, but like a garlic butter dip would be good or maybe even ranch!